The racial makeup of Denver is 77.5% White, 11.1% Black or African American, 2.3% American Indian, 4.5% Asian, 0.2% Pacific Islander and 8.2% other race. 31.2% of the population is Hispanic or Latino of any race, giving Denver one of the highest populations of Hispanics or Latinos in the U.S.
As of the 2010-2014 American Community Survey, 77.5% of Denver's population reported white ancestry. Non-Hispanic whites made up 52.9% of the city's population according to the survey, up from 51.9% of Denver's population in the 2000 Census. Major ethnic groups of European ancestry in Denver include: Germans (14.7%), British (11.3%), Irish (9.9%), Italian (3.9%), French (2.8%), and Polish (2.1%). Of the 105,000 foreign-born in Denver, 8.3% were born in Europe. Many of the early inhabitants to settle the city were of African lineage, especially those who had escaped slavery. African-American mountain man Jim Beckwourth homesteaded land in what is now Denver in 1863. In honor of these frontiersmen, Paul Stewert created the Black American West Museum in Denver. The Five Points neighborhood is historically associated with African-American culture in Denver. In the 1940s through the 1950s, jazz clubs in Five Points provided popular venues for famous African American musicians. Denver's first African-American mayor, Wellington Webb, served in that office from 1991 to 2003. The current Denver mayor, Michael Hancock, elected in 2011 and re-elected in 2015, is also African-American, as are city councilwoman Allegra "Happy" Haynes and Denver police chief Robert C. White. Former Denver First Lady and State Senator Wilma Webb led the successful movement to adopt Martin Luther King, Jr. Day as a state holiday, long before it became a federal holiday. Chinese first arrived in Denver in 1870, and settled in a neighborhood known as "Hop Alley" along Wazee Street ("Wazee" is said to be a Chinese name). Denver was the scene of a deadly anti-Chinese riot in 1880. Denver has an active population of Japanese Americans. Sakura Square in downtown Denver was founded in 1944 by formerly-interned Japanese Americans migrating from the West Coast states of Washington, Oregon, and California. The community hosts several public markets and restaurants. The former Lowry Air Force Base, is where many Southeast Asian immigrants first came into Denver. The city is home to the largest Mongolian population in the United States. In the city of Denver, the largest populations of Jews are found in the West Colfax and Hilltop neighborhoods. The heritage of many generations of Jewish Denverites is very visible in the city, and its many landmarks (several prominent synagogues among them). Denver is also home to the National Jewish Medical and Research Center. Famous Jews from or who lived in Denver include Golda Meir. Approximately one-third Denver's population consists of Hispanics or Latinos. In 1983, Denver voters elected its first Hispanic mayor, Federico Peña, who served in that office until 1991. 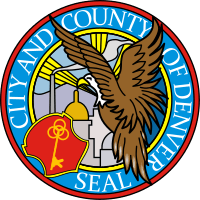 The City of Denver has established the Denver American Indian Commission to promote better relations between Native Americans and the wider community. The annual Denver Pow-Wow in March is one of the largest in the country and hosts traditional Native American dances, attracting Native Americans from across the US and Canada, as well as many non-Indians. Denver is home to many other ethnicities. There are also sizable immigrant Russian, Polish, Ethiopian, and Lebanese populations in Denver. ↑ http://factfinder.census.gov/servlet/ADPTable?_bm=y&-geo_id=16000US0820000&-qr_name=ACS_2007_3YR_G00_DP3YR2&-ds_name=ACS_2007_3YR_G00_&-_lang=en&-redoLog=false&-_sse=on Archived February 8, 2010, at the Wayback Machine. ↑ Tom Noel, "The many lives of a pioneer," Rocky Mountain News, 2 February 2010. ↑ Gerald E. Rudolph, "The Chinese in Denver: their location and occupations," in Chinese on the American Frontier (Rowman & Littlefield, 2003) 315-321.